This is the advice I give my creative writing students every semester, not because I want them to relive their traumas or even really focus on themselves so much. I ask them to write from these places because these are the living spots for story. Once something doesn’t spark an emotional reaction anymore, it’s usually sanitized, cleaned up, thought through – and it’s those kind of clean, tidy things that make for boring writing. The places where we are still raw – the moments when it feels like our stomachs folded in, the times when we clench our fists because of an off-hand comment – these are the subjects that are living. These are the places where we can find something new to say. In a sense, I guess, I’m suggesting that writers explore our scarred places. 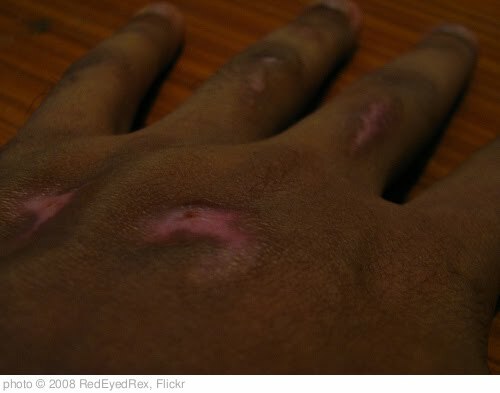 Supposedly, scars are the strongest, most resilient parts of ourselves. But sometimes, they are also the places where we get a tingle, like we’re touching our wounds from the other side. The nerve endings feel all twisted. We lay our fingers on the long side of the nerve and feel our own touch beneath our hands. It’s these new sensations, these unexplored feelings that make writing live. The exploration can be painful, but I think it can also be healing – like letting the air in and breathing over it with language. Are there things you see or hear that make you react emotionally but you’re not sure why? What would you think about writing into those places? What do you think of this idea of writing our pain? As you’ve probably noticed, we’re doing a fairly major overhaul here at Andilit. Please forgive our mess as we get things set up so that they’re more readable and accessible for you. Thanks for your patience.